March marks the final month of 1st Quarter for IFTA. IFTA is the International Fuel Tax Agreement, an agreement between the lower 48 states of the United States and the Canadian provinces (except Northwestern Territories, Nunavut and Yukon), to simplify the reporting of fuel use by motor carriers that operate in more than one jurisdiction. Under IFTA, you are able to file one return in your base jurisdiction and that jurisdiction will allocate the money appropriately. This agreement definitely simplified what used to be a very long and time-consuming process. The deadline to file your 1st Quarter IFTA return is April 30, 2014. Good record keeping now helps you avoid rushing around at the last minute and possible lates and/or penalties. 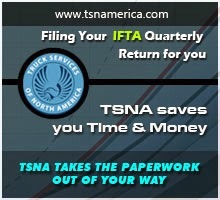 As a premier processing agency, Truck Services of North America can set up your IFTA accounts and file your Quarterly IFTA Taxes for you. You just send us the required information and we handle the rest!